Fremantle, located just 30-minutes southwest of Perth, is a port city attracting thousands of visitors each year. This isn’t just sheer luck, Fremantle has a number of attractions that draw international, interstate and even regional visitors throughout the year. Between 2014 and 2016 Fremantle played host to an estimated 228,900 visitors from around the country and the world. Within this group, 40% of the domestic travellers were here on holiday while 60% of international visitors were visiting for leisure. So, it’s fair to say that Fremantle is well worth putting on your travel list for more reasons than one. As a matter of fact, here are 5 reasons Fremantle should be your next holiday destination. It’s all well and good exploring the region via boat, bus, Segway or foot, but add in the chance to take to the skies and you’ve truly experienced the best of Fremantle. Local operator Rotorvation has the skills to take you up and over the Fremantle region for the ultimate aviation experience. In their helicopters, you’ll be able to take in incredible views of Fremantle and the surrounding region for a total of 15 minutes. Though 15-minutes might not seem like a lot of time, once you’re up there you’ll hover around the region quick fast to take in as much as you can! You won’t want to forget your camera on this adventure as you’ll be treated to some of the most incredible photo opportunities of Fremantle, the stretching coastline, nearby Perth and the iconic Swan River. Taking out our top pick for things to do in Fremantle, this helicopter experience is truly one of the best things to do if you can fit it into your travel schedule and budget. Flights take off from Jandakot Airport which is around 17 kilometres away from Fremantle and 20 kilometres out of Perth. So if you have a love for amazing experiences and great photo opportunities then this experience should already be on your radar, if you weren’t aware there were scenic helicopter flights over the Fremantle region, you’re in for a treat! For all things crafted, fresh and fun head to Fremantle Markets, one of the city’s, and perhaps the country’s, most recognisable marketplaces. In operation since 1897, the Fremantle Markets are now home to more than 150 stall holders selling a range of goods including handmade crafts, clothing and jewellery as well as fresh fruit and vegetables and ready to eat food. It’s not just about the stalls, though this seems strange as it is a market, however, the enjoyable atmosphere is made with the help of local buskers and street performers. Bringing music, magic and entertainment throughout the duration of the markets, you’ll often find yourself mesmerised by the talent of some of these local performers. The markets are open every Friday, Saturday, Sunday, Monday and on Public Holidays from 8 am to 8 pm, so there is plenty of time to browse all of the stalls, pick up a few groceries and grab a delicious bite to eat or something to drink. If there’s any attraction that stands as a symbol of the region’s history, then it’s the WA Maritime Museum on the shoreline of the Indian Ocean. Showcasing artefacts and exhibits reflective of Fremantle’s past, present and future, the museum is a great attraction that all ages will enjoy. Home to a number of visiting and permanent exhibits, such as the winning vessel, Australia II, from the America’s Cup, the HMAS Ovens, an Oberon class sub, and the Parry Endeavour from Jon Sanders’ expeditions. With a number of events held throughout the year, a museum is a great form of entertaining education that you can visit multiple times a year, especially during school holidays when you’re looking for something to do with the kids. The museum is open to the public 7 days a week from 9:30 am to 5:00 pm with the exception of Christmas Day, Boxing Day, New Year’s Day and Good Friday, with shortened hours on ANZAC Day. What’s better than walking around and taking in the sights of a city? Zipping around on a Segway and taking in the sights of course! Thanks to Segway Tours WA you can tick riding a Segway off your bucket list while also ticking off seeing some of Fremantle’s best sights! There’s the choice of a 1-hour or 1.5-hour Segway tour, both of which are led by an experienced Segway rider and tour guide who is on hand to point out the city’s top attractions including St Patrick’s Basilica, Fremantle Prison, Phillimore Street and The Round House. 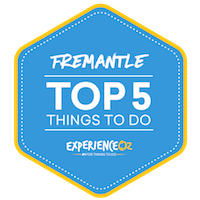 You can tick riding a Segway off your bucket list while also ticking off seeing some of Fremantle’s best sights! Suitable for children as young as 12 years, this is an awesome way to go sightseeing and is something the whole family will love! All necessary training is conducted on site by your guide so you’ll be a seasoned Segway rider by the end of the tour. Fremantle Prison is one of the region’s most iconic historical attractions, and being an operating prison from 1852 to 1991, it’s fair to say these walls would have some stories to tell. You can take a tour of the prison to learn about its history, hear tales of some of the prisoners that were locked behind the gates and walk the worn pathways between buildings. There are numerous tours available, each highlighting different features of the prison’s past. There’s the Doing Time tour, Great Escapes, Tunnels Tour, Torchlight Tour, and the Art Tour, each tour touches on different points in time but all talk about things that happened inside the walls of, or underneath, this iconic prison. Tours vary in price depending on age, however, they all range from as little as $11.50 for children and $21 for adults up to $60 for children and $100 for adults.